You can knit with double pointed needles. If you can knit at all, you can do this. It may look intimidating, but looks can be, and in this case certainly are, deceiving. Knitting in the round with double pointed needles (DPNs) only requires you to know one thing: how to make the knit stitch. What’s that you say? You have tried and had a less-than-fun time with a set of DPNs? Well I betcha I know exactly what happened: you went and used your brain. Seriously, the most common mistake I see when knitters try to pick up the trick of knitting in the round with DPNs is that they outsmart themselves. You have to dumb it down. I like to use a 5 needle set up when I go round and round on my DPNs. 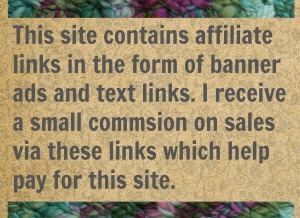 That means I have live stitches on four needles and use a fifth to knit with. Some people like to use a 4 needle set up, which is just three needles holding live stitches and knitting with a fourth. The method is the same for either and so is the trick. No matter how many needles you have in your project, you are only using two at any given time. One is the “left hand” needle, one is the “right hand” needle, and the others… you just ignore them. As I show in the video above, you knit across one needle, working each stitch from the “left” needle to the “right” same as you would in any other knitting project. Once you have knitted all the stitches on that DPN, turn the project clockwise and work across the next DPN. 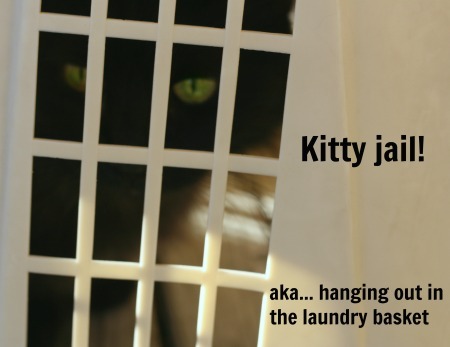 The other needles dangle and you pretend they are not there. Its that simple. Its so simple that you have been, and perhaps still are, instinctively trying to find a way to complicate this all up. But stop. Don’t use your brain so much. Just knit, turn, and knit. When you knit in the round with DPNs it looks like you are somehow knitting with 4 or 5 (or even more) needles all at the same time, which would be impossible. To do something like that you’d need 4 or 5 (or more) hands. In reality you only work with two needles at a time, which is quite fortunate since the basic human design package is a two-handed model. 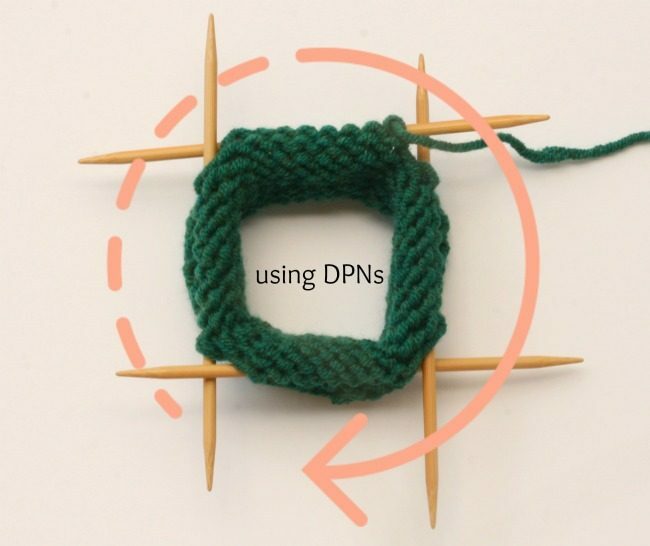 Give knitting in the round with DPNs a try. If you have trouble with stitches falling off, switch to wooden needles. (FYI, almost every beginner has trouble with metal DPNs so don’t beat yourself up for that!) Wooden needles will give you the grip you need. I think if you can turn off that big brain of yours and just knit, you’ll find DPNs are quite easy to master. But if you find your DPN mastery impressing the snot out of a non-knitterly type (and it does), feel free to play that up. After all, at first glance knitting with a set of DPNs is a bewildering feat. So let the public admire the awesome ninja-esque skill that you have acquired and give them your best Mona Lisa smile while you just… knit. I’m still not as good at knitting as those Victorians → ← Can’t talk. Knitting! 19 Comments on "Don’t Let Double Points Scare You"
Most welcome. I use both DPNs and circular needles myself. Its always nice to have more than one option! I usually go for circs when I take my knitting with me for exactly that reason. It just too easy to loose a dpn when you are on the go. Great tutorial, first time my mother saw me using dpn’s she said that looks difficult. I tried to show her but at 84 she isn’t willing to try knitting. Well you just can’t force the yarn obsession on some people. And if I manage to reach the grand age of 84 I plan to be ornery and stubborn myself! If you can’t blow off other people and do whatever you like when you are in your 80’s… when can you? Your graphic showing clockwise rotation seems backwards. It’s clockwise If you are looking at the piece from the cast-on edge (from the bottom). The picture shows clockwise from the top. I rotate my work counter-clockwise as viewed from the top….working right-to-left dictates this direction. They certainly are. My first knitting in the round was on DPNs. Thank you for your videos. They are wonderful!!! I’m happy to make them! Thanks for the encouragement.